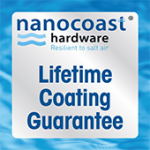 Available as part of the UAP Nanocoast range which comes with a LIFETIME coating guarantee! Key fishing or letterplate fishing is a technique burglars use to get hold of your keys, purse, handbags and more without even having to enter a property! They simply push open your letterbox flaps and use a long hooked rod, similar to a fishing rod, to ´fish´ for your keys and handbags. Meaning they can then use the keys to just walk into your customer’s property and help themselves to anything they want before driving off in their car! 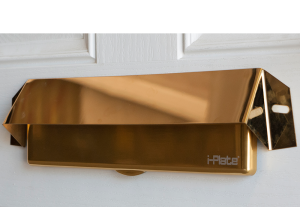 The UAP screw fix letterplate restrictor Shroud will stop hands getting through your letterbox and either hooking your keys, or opening your lock. This simple but effective device is 14.5″ long and stops the inner flap opening more than 40 degrees and so stops unwanted hands being able to manoeuvre a rod inside. The PVD gold and mirror polished screw fix letterplate shrouds are made from 316 grade stainless steel, and is part of the UAP Nanocoast range. The UAP Nanocoast range of products are specifically designed for areas which are within a 25 mile radius of the coast, or within 5 miles of highly populated industrial areas. The identity card slot have been salt spray tested to ASTM B117 for 2,000 hours, and comes with an industry first LIFETIME coating guarantee, as the products will not pit, rust or corrode no matter what environments you put them in! Used to test the colourfast of plastic and anodised products, the UV machine measures the stamina of the letterplate restrictor shroud finish, testing how quickly it will fade in sunlight. It does this using UV lights which the products are left under for 2000 hours. This machine tests the corrosion resistance of the letterplate restrictor shrouds and many other products. The salt spray cabinet produces a corrosive environment, by releasing a dense saline fog into the chamber which the products are exposed to. This creates accelerated corrosion to the product and allows us to test how well the product would stand up in harsher environments. Aluminium based products are tested to ASTM B117:2005 for 480 hours, where we offer a 5 year inland guarantee. Stainless steel products are part of the Nanocoast range, and are salt spray tested to ASTM B117:2005 for 2,000+ hours, and we offer a lifetime coating guarantee on these products. UAP Ltd distribute a range of ID card slots and letterplate shrouds, made from aluminium, zamak and Nanocoast 304 or 316 grade stainless steel. 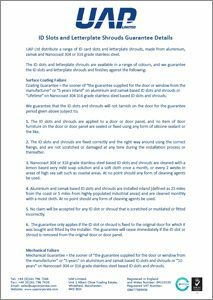 Coating Guarantee = the sooner of “the guarantee supplied for the door or window from the manufacturer” or “5 years inland” on aluminium and zamak based ID slots and shrouds or “Lifetime” on Nanocoast 304 316 grade stainless steel based ID slots and shrouds. 1. The ID slots and shrouds are applied to a door or door panel, and no item of door furniture on the door or door panel are sealed or fixed using any form of silicone sealant or the like. 2. The ID slots and shrouds are fixed correctly and the right way around using the correct fixings, and are not scratched or damaged at any time during the installation process or thereafter. 3. Nanocoast 304 or 316 grade stainless steel based ID slots and shrouds are cleaned with a lemon based very mild soap solution and a soft cloth once a month, or every 2 weeks in areas of high sea salt such as coastal areas. At no point should any form of cleaning agents be used. 4. Aluminium and zamak based ID slots and shrouds are installed inland (defined as 25 miles from the coast or 5 miles from highly populated industrial areas) and are cleaned monthly with a moist cloth. At no point should any form of cleaning agents be used. 5. No claim will be accepted for any ID slot or shroud that is scratched or mutilated or fitted incorrectly. 6. The guarantee only applies if the ID slot or shroud is fixed to the original door for which it was bought and fitted by the installer. The guarantee will cease immediately if the ID slot or shroud is removed from the original door or door panel. Mechanical Guarantee = the sooner of “the guarantee supplied for the door or window from the manufacturer” or “5 years” on aluminium and zamak based ID slots and shrouds or “10 years” on Nanocoast 304 or 316 grade stainless steel based ID slots and shrouds. 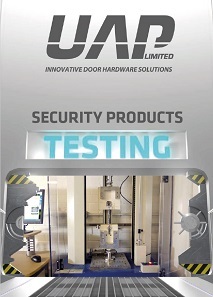 We guarantee that the ID slots and shrouds will not fail mechanically on the door for the guarantee period given above subject to the conditions outlined above.